Republicans lead in party registration now by 4.3 per cent. And this indicates who has the advantage on election day. 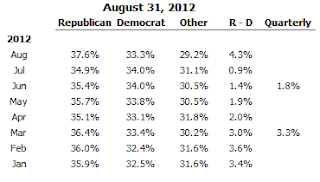 When Demos lead in party registration they win. When the gap is small Republicans win. This is Rasmussen's Summary of Party Affiliation. DATECHGUY shows this with the data for recent elections. He shows the presidential elections of 2004 & 2008 and the 2010 Republican blow out.